The discontinued ProForm 595Le treadmill features push-button controls for adjusting incline and speed. The 595Le has a maximum user weight limit of 250 pounds, and the deck folds up against the console for storage. Combined with the treadmill's front wheels, this feature allows you to move the treadmill around without additional help. 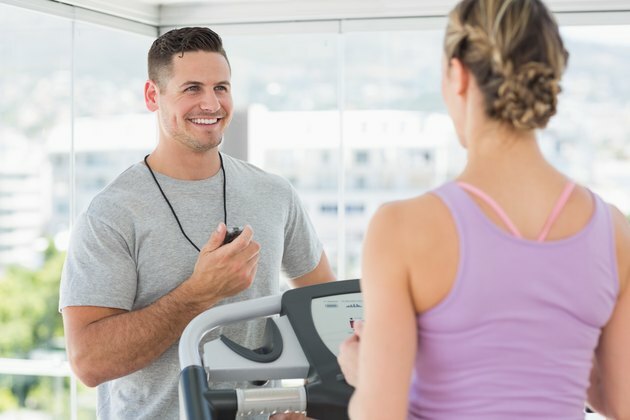 Plug the treadmill into an electrical outlet and push the "On/Off" switch near the power cord, so that the side marked "-" is pressed in and the side marked "o" protrudes. Hold on to the treadmill's handles as you step onto the foot rails to either side of the treadmill belt. Standing on the rails, instead of the treadmill belt, keeps you from losing your balance when the belt starts moving. Insert the safety key, which looks a bit like a credit card, all the way into the slot on the nearest edge of the treadmill console. Attach the safety clip, attached to the key by a cord, to the waistband of your clothing. If you fall or lose your balance, your weight will pull the key out, stopping the treadmill. Press the "Speed" button, marked with a triangle pointing up to start the treadmill. Hold on to the handrails as you step onto the moving belt and walk. Adjust the treadmill speed up or down by hitting the "Speed Up" or "Speed Down" buttons respectively. The "Speed Down" button is marked with a downward-pointing arrow. When you're ready to stop, hold on to the treadmill hand rails and step onto the foot rails to either side of the belt. Press the "Stop/Reset" button to stop the treadmill belt. Remove the safety key when you're done exercising. This helps prevent small children from starting the machine.